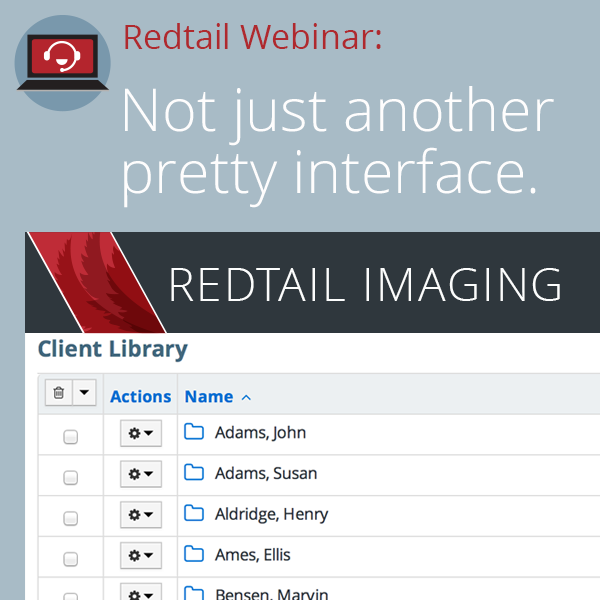 Redtail's new Imaging application is now available and we will be rolling it out to all Imaging customers over the coming weeks. We think you'll be pleased with the new interface, the increased functionality and the ease of use. Please join us for one of these webinars where we'll be covering everything you need to know about the changes. Those not currently subscribed to Imaging are welcome to join as well! Wednesday, October 30, 2013 1:00 PM - 2:00 PM PDT: Redtail Imaging's New Look! Thursday, October 31, 2013 1:00 PM - 2:00 PM PDT : Redtail Imaging's New Look! Friday, November 1, 2013 1:00 PM - 2:00 PM PDT : Redtail Imaging's New Look! Monday, November 4, 2013 1:00 PM - 2:00 PM PST : Redtail Imaging's New Look! Wednesday, November 6, 2013 1:00 PM - 2:00 PM PST : Redtail Imaging's New Look! Friday, November 8, 2013 1:00 PM - 2:00 PM PST : Redtail Imaging's New Look!